when I try to add some of the new maps from mappack4, then they are blank in the list besides the map number. The maps are in the list you can pick from, but ex levels/mp_012cq for port valdez isn't listed but just blank. I to have same problem. i have procon hosted on PHS, now with that plugin you cannot change anything at all it just changes everything to default settings. So i decided to run a test and see if i could edit the plugin with local procon connect to gs. and i am able to add maps via the add or remove map in list feature and change other settings with out it changing back to default plugin settings, however it still does not list Port Valdez "levels/mp_012cq" or Atacama Rush "levels/mp_005GR" just a blank space next to number. ok can now edit the plug in however still unable to see Port Valdez cq or atacama ru in plugin list still only blank space. i only have atacama and port valdez running any chance you could add the option to keep current map, say if playing Port Daldez and Atacama was dure to load next, but if enough votes were cast would carry on playing Port Valdez. or vis versa if playing Atacama was playing and Port Valdez was due to load next. help on getting Port valdez to so in votemap plugin would be greatly appriciated. mine still not listing for some reason arrr, i've even deleted procon from system re-downloaded procon and votemap and still not listing ht emaps. The list option.txt doesn't list level/mp012cq or level/mp_005gr maps either. and now everything is working perfectly. I have not added the new maps yet but will still do it. Ps. I run mixed gamemodes v3 with all rush and conquest maps in rotation and all is working perfectly. 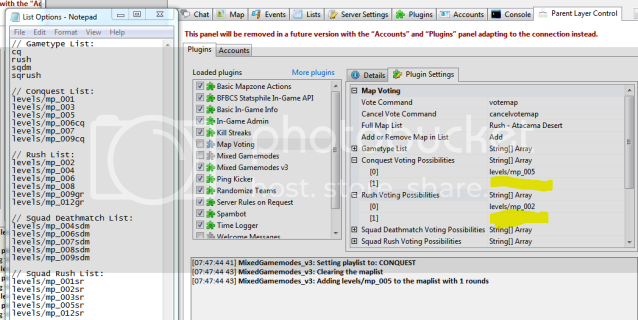 Edit the maps in on the source code, then when you reload the plugin it will show by default.